For over 40 years, the Law Office of Jerry W. Melton has helped Dallas-area residents with a number of legal issues – including family law, criminal defense, and civil litigation. Our law firm is trusted to provide comprehensive legal care to protect you, your assets, and your family. With so much at stake, you deserve a qualified lawyer who can explore all your options with you. 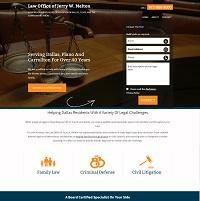 Jerry W. Melton is an attorney who is certified by the Texas Board of Legal Specialization in both Family Law and Criminal Law, giving our firm a unique perspective on your case. Dual specialty is rare in the law community, and can be a valuable asset in your case. Whether you are confronted by a family law issue, or are in need of a reliable criminal defense, or possibly both – you can rest easy knowing that our law firm has decades of experience working for you. We work to provide consistent and transparent service to our clients. We answer calls and e-mails promptly, and communicate with you frequently on the status of your case. The legal process can be intimidating, but our team takes every measure to help navigate you through your case. Contact the Law Office of Jerry W. Melton today for a free initial consultation regarding your case. Our office is open Monday through Friday during regular business hours.